As consumers, we have a lot to consider before making purchases; value, durability, style, environmental responsibility, and even the conditions under which the product was made. Some items are notorious for being manufactured using unfair labor practices, and unfortunately cocoa (the key ingredient in chocolate) is one of them. In 2001, the US was concerned with this subject when it was found that child slavery was involved in producing 43% of the world’s supply of cocoa! In response, Global Exchange says that, “…the US chocolate industry agreed (via the Harken-Engel Protocol) to voluntarily take steps to end child slavery on cocoa farms by July of 2005. Unfortunately, this deadline has now passed, and the chocolate industry has failed to comply with the terms of this agreement.” Nice. Is it just me, or does it seem a bit perverse that child slaves in Africa are making the chocolate that American kids are given to enjoy on Halloween? So what can you do to help end child labor in the production of cocoa & chocolate? Simply spend your money with companies that adhere to Fair Trade practices. There are lots of retailers who produce Fair Trade chocolate, and there is even a Fair Trade Halloween kit available to take things a step further. 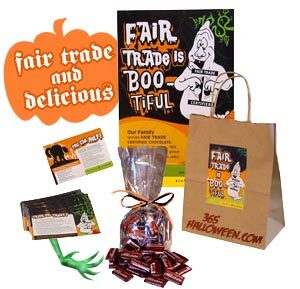 In the kit there are (in addition to 42 delicious chocolates) 42 festive Halloween postcards to hand out that give knowledge about the importance of Fair Trade, all for just $15. (Spend $20 and you can enter coupon code ftm2006 to save 10%. Why not buy 2 or more kits to get this discount?) So you can still give out yummy chocolate candies, but toss an informative postcard into their candy sacks at the same time and you’ll help spread the word, too. Another alternative: give non-chocolate goodies on Halloween. I haven’t sampled many of the brands that are available, but I love Lara Bars (their Maya line uses cocoa) and Dagoba, and have heard so many people rave about Green & Blacks and Endangered Species. What’s your favorite brand of Fair Trade chocolate? Subscribe to comments with RSS or TrackBack to 'Fair Trade Halloween'. I’m so glad you posted this! It’s great to see the word get out about the ethics of the chocolate we buy. I’ve been on a mission to try all the fair trade chocolate out there. I costs a little more, but it’s usually much better than the grainy consumer stuff (and rivals the gourmet brands). Dagoba is excellent and Endangered Species makes some little chocolate squares called Bug Bites that would be great for Trick or Treaters. The non-chocolate idea is good too, and there are lots more options for all-natural and organic that are actually tasty enough that the kids won’t egg your house after you drop it in the bag.